Product categories of Self Leveling Cement Floor, we are specialized manufacturers from China, Self Leveling Cement Floor, Basic Cement Self-Leveling Floor suppliers/factory, wholesale high-quality products of Cement Self-Leveling Base Floor R & D and manufacturing, we have the perfect after-sales service and technical support. Look forward to your cooperation! 1, tile, vinyl plastic panels, linoleum, rubber flooring, Epoxy Flooring layer of the leveling layer. 2, warehouse ground, parking, forklift work area and other ground hardening treatment. 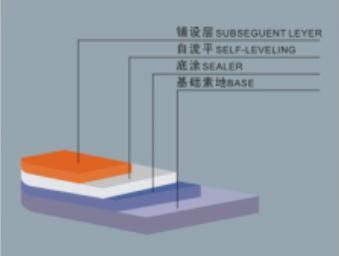 KS-SZ40 can be used as cement-based ground hardening materials, but also with epoxy resin, PVC and other production of composite flooring. 3, for all the pores and the depth of more than 2mm surface, should use a special repair mortar be repaired, it is recommended to use KS series repair mortar. 3, the base oil can be a large brush or mop brushing the end of the oil, the general brushing twice, the first brushing the bottom oil evenly applied to the base surface, shall not ignore any base surface to be processed. The second time, wait for the first brush the end of the oil dry, the second brushing, if the porous base, but also for the third time at the end of oil, so wait for the end of oil dry before pouring KS series of self-leveling. 4, in order to reduce the construction joints, to continuous casting, the middle of the pause time shall not exceed 2 minutes, the floor thickness to be obtained in a casting.